OSWEGO – SUNY Oswego art faculty member Julieve Jubin’s 2011 photography work in Havana helped inspire “Imagining Cuba,” featuring 32 works of 11 photographers who capture images of the politically isolated Caribbean nation in a free exhibition that will start March 26 at Tyler Art Gallery. Husband-and-wife photographic team Liudmila Velasco and Nelson Ramirez de Arellano Conde made “Payret” for their series “Hotel Habana” in 2009. The piece is among the 32 works of 11 photographers in “Imagining Cuba,” an exhibition that begins March 26 in SUNY Oswego’s Tyler Art Gallery. Co-curator Jubin and Italian guest curator, fine arts professor and photographer Carmen Lorenzetti, who is also transfixed by the “mythic quality” of Cuba, are scheduled to attend the exhibition’s opening reception, slated for 5 p.m. April 5, at the gallery. In a related event, the SUNY Oswego Latin Jazz Ensemble with special guest Cuban percussionist Emilio “Emilito” Del Monte will appear in a free concert starting at 7:30 p.m. in Hewitt Union ballroom. “Imagining Cuba” will run through April 27, simultaneous with the Master of Arts Exhibition in another wing of Tyler Art Gallery. “Photographing Cuba is an activity that has impassioned generations of professional and amateur photographers alike from all over the world to search for the secret of its political and cultural uniqueness,” Lorenzetti wrote in an artist’s statement for the exhibition. “It constitutes the background scenery of innumerable memories of Cuba and tells an unchanging story/history that has not found a way to renew itself over time,” she said. Jubin, coordinator of SUNY Oswego’s photography minor, took students to Cuba in 2011 as a result of her photography there for the “Centro Habana” photo series. 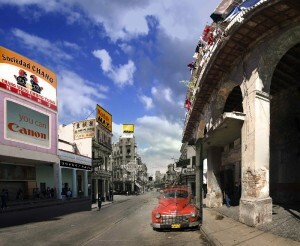 The exhibition also will appear in 2014 at the Fototeca de Cuba in Havana.